Yesterday afternoon, we had a wonderful visit from artist Will Worthington who donated an original painting of Cernunnos and some prints of his paintings which were used for Phillip & Stephanie Carr-Gomm’s DruidCraft Tarot. This Cernunnos was originally painted for the Tarot but a different image was finally used in the actual deck. I believe there is a new Druid Plant Oracle coming out soon. 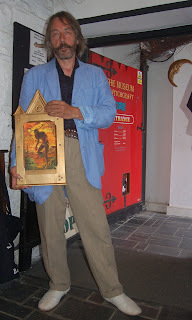 The painting will be placed in the Horned God section as soon as it is catalogued & Graham has been keen to get a tarot display happening for some time – maybe this will spur him on. How lovely! I’m down in Boscastle later this year and so look forward to seeing them.